This article explains Critical Chain Project Management (CCPM), developed by Eliyahu Goldratt in a practical way. After reading it, you will understand the basics of this powerful project management tool. What is Critical Chain Project Management (CCPM)? Critical Chain Project Management (CCPM) was first introduced in 1997 by the Israeli physicist Eliyahu Goldratt in his book ‘Critical Chain’. Critical Chain Project Management (CCPM) is a planning method to better manage projects. With Critical Chain Project Management (CCPM), organisations are not only able to run projects faster, but also to execute them more cheaply. Practice shows that, in about 70% of the cases, problems occur with project management; for example, projects don’t start on time, projects exceed the budget or projects aren’t completed within the agreed timeframe. Every project has to deal with a so-called ‘critical chain’. This is the longest chain of tasks, which ultimately determines the entire project duration. This ‘critical link’ has the most influence on turnaround time, and it’s this link that plays an important role within CCPM. CCPM is a method that allows you to better plan, execute and manage projects. With traditional project management methods, 30% of lost time and resources typically occurs as a result of wasteful techniques, such as poor multitasking. Student Syndrome and Parkinson’s Law, two examples of how time can be wasted, are later explained in this article. Wasting time causes delays and a lack of prioritisation. Critical Chain Project Management (CCPM) was developed in reaction to projects that are marred by poor performances. Think, for example, of running deadlines, running times with a different interpretation of time, rising costs and other unforeseen events. 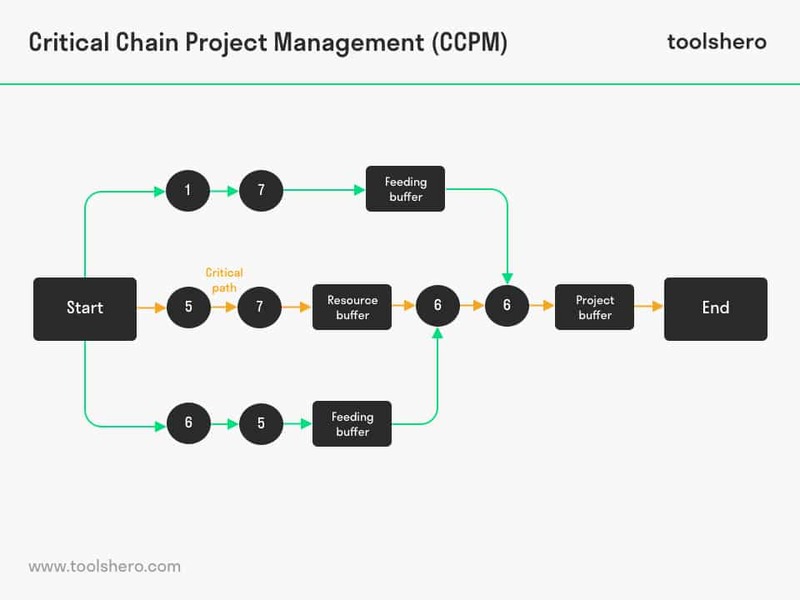 With Critical Chain Project Management (CCPM), one seeks to do what’s necessary to keep the project (the input) equal to the end result (output) and requires, among other things, flexible start times. The progress of a project can only be properly monitored by monitoring the buffers. With CCPM, one acknowledges that possible undesirable behavioural effects are due to the combination of built-in buffers and fixed start and end times. By removing bad multitasking, this can quickly be solved. Multitasking occurs when one works on multiple tasks simultaneously. Multitasking works well when two or more tasks actually take place simultaneously. In reality, this is often not the case and the aforementioned project buffer is cancelled. There’s a shortage of time, which delays other tasks. This often results in the deadline being exceeded, and as a result, projects are delivered late rather than early. By analysing multitasking and using it in such a way that several tasks are performed simultaneously, one can create a good project buffer that protects the project. As a rule of thumb, a 90% chance of timely completion equates to 50% of the duration of the longest chain of project tasks. This can reduce the total project duration by 25%. Sometimes problems develop beyond the critical chain, which in turn affects the project duration. Such problems are unwelcome and must be avoided. One way of doing this is by protecting the supply of sources (inputs) with a buffer. Instead of supplying raw materials shortly before they are used and/or processed, for example, one would be advised to use a margin here. By having the raw materials delivered a week earlier, they can be used immediately. The resource buffer can also be used to plan as late as possible. After all, starting later offers one the advantage of being able to anticipate changes in situations for as long as possible. The resources are also available for other purposes. It’s also good to add safety buffers to the entire project, as completing the entire project is a more important goal than completing individual tasks. Adding a safety component will shorten the individual tasks, so that less time is wasted in general. Partial tasks are given a little more time in advance, which makes it easier to complete them prematurely. Within Critical Chain Project Management (CCPM), the emphasis is on resources such as people, machines and the space needed for production. In the more traditional methods that result from the critical path, the emphasis is on the order of tasks and tight planning. CCPM is all about making the best possible use of all the resources needed to carry out project tasks. Think of raw materials, equipment and machines, employees and physical space, such as a factory building. By combining human behaviour with other uncertain factors within the project, with CCPM, one is able to complete a project earlier and deliver it at later costs. This makes it a nice addition to existing project methods. People can also be the cause of wasted time. Examples include: a task requiring more attention, an employee dividing his/her time over several tasks (multitasking), the employee becoming quickly distracted or procrastinating. This is difficult to counter with safety buffers. This is the human tendency to start a task as late as possible. This procrastination is comparable to the behaviour students show when they have to study for an exam. In most cases, they start too late, causing them to run out of time. This law is about actually ‘consuming’ the time that has been reserved in advance for a task. According to this law, if a project has been given 3 days to be completed, even though it has been completed within 2 days, the full 3 days will still be used for the project. This makes it almost impossible to finish earlier, which of course, doesn’t benefit the total project duration. The potential gain in time is wasted. To monitor the progress within CCPM, it’s useful to look at how the buffers are used and how to fit them throughout the duration of an entire project. When a task runs out, the extra time can be taken from a buffer. On the other hand, if a task is completed earlier, this extra time flows back into a buffer. By comparing the percentage of time elapsed with the percentage of time spent in buffer, one can create a good overview of the progress of the project. This way, it becomes easy for one to see where action is still needed and where it’s not. One can get a good idea by working with colours. For example, green means that no action is needed, yellow indicates a higher level of alertness, and red means direct intervention and/or action is required. The progress of the total project can then be shown in a graph. What do you think? Is Critical Chain Project Management (CCPM) applicable in your daily work? Do you recognize the practical explanation or do you have more suggestions? What are your success factors for scheduling and managing multiple projects? Goldratt, E. M. (2017, 1997). Critical chain: A business novel. Routledge. Herroelen, W., Leus, R., & Demeulemeester, E. (2002). Critical chain project scheduling: Do not oversimplify. Project Management Journal, 33(4), 48-60. Rand, G. K. (2000). Critical chain: the theory of constraints applied to project management. International Journal of Project Management, 18(3), 173-177.